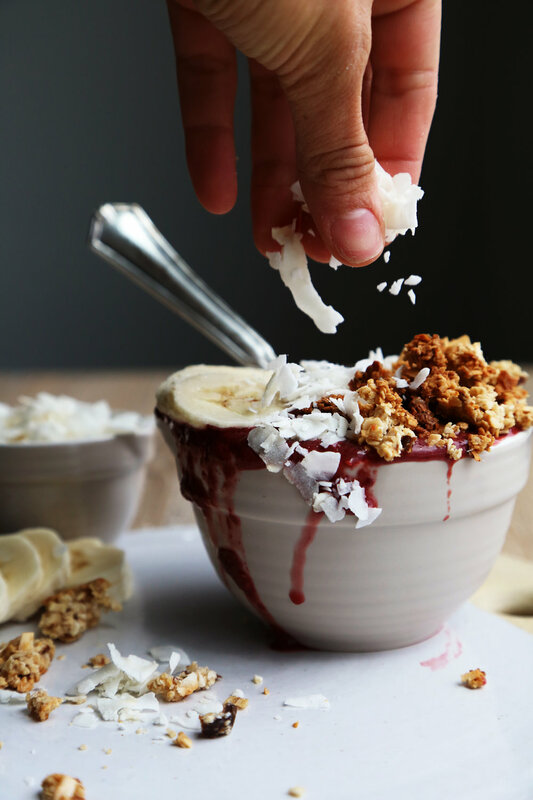 How do you say no to a delicious homemade Acai bowl? Simple answer.... you don't! I love the refreshing thick texture that acai adds to your smoothie, not to mention the tart finish! Truly a refreshing breakfast or snack! You can really top yours with any fruits you want to but I used my favorite below! Whether you are just making one for yourself or for your friends always make it look pretty! You know why? It is proven to make you feel super fancy and some say it taste better! But, even if you throw it in a bowl, like I do half the time, it still tastes amazing! I get my acai either frozen from my local grocery store or I buy mine off of Thrive Market! I love Thrive Market because I can order my favorite foods and the best thing is it also gives meals to families in need. One thing I don't advertise much about myself is that I love to volunteer and do my part to help people and animals in need! Whether its using glass or metal straws like these here, or purchasing your products off of Thrive Market every little notion makes a difference in the end! Its easy to sign up and helps people so sign up here! Okay guys lets get to blending! - topped with 1/2 of banana or any other fruits you like (strawberries, raspberries, blueberries, kiwi etc! 3. If your blender becomes stuck, add in your splash of almond milk and blend until smooth! 5. If you are feeling fancy feel free to drizzle with honey * that is my favorite part!